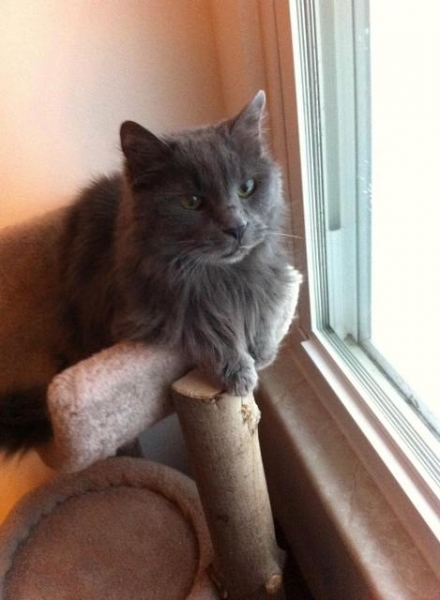 Several months have passed since I lost my beautiful grey cat Maggie. She was very special to me and the last of my four fur cat kids. I haven't been able to say thanks for all the loving care you gave her for her nearly 16 years I was blessed to have her, until now. Her loss was more devastating than I ever dreamed. ( I just couldn't find the words to say how I felt.) To have no further cat sugar or kitty kisses nearly breaks my heart. I feel her presence so near to me and I know she is at peace. You all helped to give her a long long life with heart problems that never seemed to slow her down. I was fortunate that her heart condition posed no problem until the end. My sincere thanks to all the staff for their compassion and understanding of the loss I was going through. And especially to Dr. Krista who watched over her those many years. And Dr. Van Horn for easing her passing, ending her suffering with care and compassion that all animals deserve. I can't say enough thanks for all the love you showed sweet Maggie over the years, fortunately she wasn't a frequent flyer like some of my other fur kids. A poem posted on Facebook prompted me to find the words to say thank you for the love and compassion everyone showed my sweet sweet girl. I do and will always entrust the care of my fur kids to all of my dear friends at Tri-City. You all go way above the call of duty from Phyllis who let me pester her constantly to everyone else at the clinic who showed their love and compassion for her and myself on her last day. Thank you to the best team ever.